PhilBoxing.com >> News >> List of Articles >> Joaquin Henson: Is Mayweather stalking Manny? Talk of a rematch between WBA welterweight champion Sen. Manny Pacquiao and undefeated Floyd Mayweather, Jr. started to gain ground when the boxing icons got together in a supposedly accidental encounter before over 100,000 revelers in an electronic music festival called Ultra Japan at the Odaiba Park in Tokyo last September. What are the chances that two popular fighters who figured in a highly-profitable and controversial bout in 2015 would be in the same venue with a potential to go viral? How convenient that they were in Japan at the same time on business? Mayweather and Pacquiao flew to Tokyo to meet up with Japanese investors interested in paying big money to ride on their popularity for endorsements. And so Mayweather came back last December but not to fight Pacquiao. He went to Saitama, picked up a check for $9 Million and devastated a 20-year-old kickboxer Tenshin Nasukawa who was prohibited from kicking in the exhibition bout. The match was over in 139 seconds as Mayweather, outweighing Nasukawa by close to 10 pounds, decked his opponent thrice before the referee stopped the carnage. The fight was a joke and Mayweather laughed all the way to the bank. Surely, the Japanese businessmen who plunked money on the event weren’t too happy at the way Mayweather took them for a ride. Don’t expect a warm welcome for Mayweather next time he visits Japan. Mayweather, who turns 42 on Feb. 24, is like a shark smelling blood when there’s money within reach. Last May, he came to the Philippines to check out Pacquiao’s territory. Mayweather probably wanted to find out if his popularity was still at a high level to generate interest for a second meeting with Pacquiao. 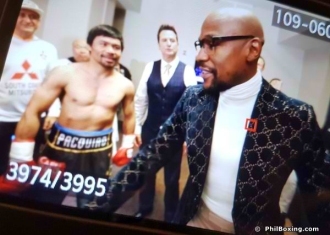 A few weeks ago, Pacquiao was a guest at the Filipino Heritage Night with the Los Angeles Clippers hosting the Charlotte Hornets at the Staples Center in Los Angeles. Guess who was also in the building? Two nights after Pacquiao beat Adrien Broner in Las Vegas, the Filipino legend was back at the Staples Center to watch the Golden State Warriors dismantle the Los Angeles Lakers. Lo and behold, Mayweather was there, too. Of course Mayweather was at ringside when Pacquiao beat up Broner at the MGM Grand Garden Arena. When they met in 2015, their fight set a pay-per-view record with 4.6 million buys amounting to $410 Million and gate receipts totaled $72 Million. Mayweather’s estimated paycheck was $250 Million while Pacquiao bankrolled about $120 Million. With Pacquiao looking impressive in back-to-back wins over Lucas Matthysse and Broner, fans are wondering if he can tag Mayweather with his first-ever loss. In their first meeting, Pacquiao fought with an injured right shoulder starting the fourth round yet survived the full route and won in several sportswriters’ scorecards despite the handicap. Fans will pay good money to witness Mayweather’s downfall. If Pacquiao’s a hero, Mayweather’s the villain. Their fight is a classic confrontation between good and evil. That’s why there’s public interest in a rematch. Mayweather’s advisor is Al Haymon with whom Pacquiao has a co-promotional agreement. If Pacquiao and Mayweather decide to do a rematch, they just need to agree on how much each one will earn. They’re on their own. They won’t deal with any other promoter because they call their own shots. Mayweather’s a smart guy. He’s not signing up for a fight where he can’t pull in a bundle. If the money’s right, Mayweather will fight----that’s a sure thing. There’s one other consideration. Mayweather must be convinced that if he faces Pacquiao once more, he’ll win again. Legacy is important to Mayweather. And his unblemished record, too. Pacquiao had a convincing performance against Broner and Mayweather must now be thinking twice about his chances to win. The stalker may be doubting his ability to repeat over Pacquiao.